I enjoyed the convergence of personal, historical and larger linguistic movements here. It hurts somewhere I can’t quite explain when I hear anyone say that any language isn’t worth “saving”. For me it’s no different than the last of a tree species or a very endangered animal. Diversity is under threat a bit all over these days. I’ve spent many a night wondering how it’s gotten here, and how to move in a direction that seems healthier. My easiest answer is “local”, and yet it’s not easily to live 100% local considering the average lifestyle and vocational opportunities most of us “walk into”. Likewise, my life partner is ‘bretonne’ and her native language is diminishing fast, though there are many locals that hold very tightly to it. Maybe that’s what was most surprising to you, and to me while reading your thoughts. The topic of the successful renaissance of Hebrew usually comes up in such discussions. In fact, I found myself discussing it on the remote island of Skellig Michael in Ireland last summer! One “advantage” that the revival drive for Hebrew had was that Hebrew became the only language people coming from every imaginable place in the globe had in common. In comparision, people in ireland /Scotland do have a common language they are using. Tha sin gle mhath! Slainte! Langauge is so central to our being that it’s hard to be objective about it. In my view, it’s not something we can think ourselves into doing; it’s something we have to feel. My wife is Chinese and we live in Beijing but we nearly always speak English at home, unless we use Chinese or Nepali (another language we both kind of know) “for fun”. This makes Chinese an endangered language at home because it’s never really used for real communication ~ our common language is English, for better or for worse – for me for the worse as it prevents me from improving more than I (what little) have done. When in the classroom, I find I sometimes have to cajole my students into using English when doing group work – even when we are doing a speaking skills lesson. I understand their reluctance in a way – they just feel incomfortable using this language when another seems more natural and is the one they usually use with one-another. I guess my point is that languages can’t be externally controlled – choosing to use one language over another is something which comes from the inside out. I’ve noticed how I, like many expats in China, use what’s called ‘Chinglish’ with other expats and Chinese people. I think it’s a group thing. There have been several attempts to ‘stamp out’ Chinglish but stopping people from using a language is just as difficult as trying to make them use it. It has to come from inside. Yes, the complex issues of language and identity. Ignorance seems to play a big part though, the people who argue most loudly against minoritised languages like Gaelic are often totally ignorant of most facts relating to the topic, even rather obvious ones. “It’s dead” – then what am I speaking? “It’s a Western Isles thing” – then why is there a sign saying Kirkintilloch outside the pub? “Mandarin is more useful” – you’ve taken it up then? and incidentally, football isn’t really useful either. Thanks Naomi, Chris, Alasdair and Akerbeltz for your encouraging comments, but I’m not sure if I’m advocating the teaching of Gaelic in particular here. I agree with Gordon’s very sound comments that it is a really tall order to try and save a language or to enforce Gaelic as an L1 or an L2 in schools, and it would be harsh to judge the Highlanders (who incidentally are my friends) for not wanting their children to ‘waste’ time on learning what they consider is a dying language. Okay, I can never get the HTML tags to work for me properly when putting links in! Sorry about that. Wow, thank you so much for putting this out there! It’s good to know that the current battle to try and get people to see what’s really at the heart of the decline of Gaidhlig (or any other minority language for that matter) is being highlighted! I hope many Scots read this and see the true importance of Gaidhlig! ‘S math a rinn thu! A very interesting post. Coming from Scotland myself, I’ve got to admit that when my students as me “What language do you speak in Scotland?” I will only sometimes mention Gaelic and refer to it basically as an almost-dead language. 1. Apparently being bilingual protects the brain (http://news.bbc.co.uk/2/hi/health/3794479.stm) and, this being the case, I can see that a bilingual society would be mentally healthier if nothing else. I also remember talking with a Czech student who admitted that he loved the fact he was Czech because he also spoke English therefore he could understand what most people were saying but if he and his friends wanted some privacy… well, most Europeans don’t speak Czech. I’m sure I know a lot of Scots that would enjoy that advantage over the English. 2. The concept of saving a language is a very noble one but it is a lot of work. By taking on a dying language as an L2 (what it would be for most people in Scotland) you are really committing a lot to something with limited rewards… before people take offence to this, let me explain. Being native English speakers, I think we are ‘cursed’ in a way by natively speaking the most used language on the planet. In this way I think we often tend to view languages by the numbers – I know English, I can communicate with X number of people in X number of countries; if I learn Spanish I will be able to communicate with Y number more people in Y number more countries. The available time that most people have for language learning is limited and therefore trying to push the usefulness of Gaelic is a hard sell. 3. I appreciate that, actually, you are not advocating Gaelic as an L2 but rather as a dual L1 – Scotland should focus more on Gaelic in the schools and the classrooms (the scenario that your highlander friends rejected). All I can say to that is that you’re asking a lot. Admittedly it’s been a few years since I was at school but if they were going to teach Gaelic in the same way I was taught French and German… then you might as well put the final nail in Gaelic’s coffin right here and now. This has turned into a much longer post than I had intended but I’ll finish by saying this. I think that more Gaelic would probably be a good thing for Scotland. Having grown up there with the distinction of having English parents I was sensitive to the tensions and a certain amount of resentment the Scots have towards the English. In my mind, this makes the culture a very ‘anti-’ culture. “Tell me about the Scottish.”, “We’re not English”. If the Scots could replace that first negative reply with something more positive like “We speak Gaelic.” then immediate the cultural definitions would start off on a more positive note. Oh I’m with you on “teaching” it as a subject. But then the world has moved on and the neat thing about immersion teaching is, it’s not a subject. Being taught through the medium of English may have made you hate calculus for what it is but hardly the English language for being the medium. Feel free to substitute any language for “English” in the above. The sad thing is, while having teeth doesn’t make you a dentist by general consensus, having a language seems to make everyone a linguist o.O Our ideas of what puts kids off something, I suspect, are rarely spot on. But I have yet to come across a kid who said “I hated being taught in X ” (except for those who were taught in an L2 they didn’t really speak, like my mother who was Cantonese L1 with very little English and then was sent to an English medium secondary school…) – they just hate maths or science or biology or whatever. Your point seems to support TBL (task based learning) and I couldn’t agree more. There seems to be something that makes that last mile, those last few percentage points the most difficult. If we focus on the language then the language is difficult, if we use the language as a tool to focus on something else, then that something else is difficult and the language just gets dealt with! Bringing it round to Gaelic: drama, music and games in Gaelic would spread the language quickly amongst children without reverting to verb tables and “the pen is on the table”. I love what you said about having teeth not making you a dentist but having a language making everyone a linguist! How true! The rise of the communicative era in English language teaching has seen the development of CLIL (Content and Language Integrated Learning) and TBL, alongside other communicative approaches to teaching. Yet, the teaching of other languages seems slow to benefit from this turn in language teaching and the Applied Linguistics research done in this area. Hopefully, we can see more of that not just in the teaching of Gaelic, but other languages as well! As someone whose father and Aunties all had Gaelic as their first language, it’s a source of sadness to me that the language is dying. I think the acceptance by ‘local’ Gaels that the language is dying is also an acknowledgement that you cannot divide a language from its culture and its community. The community described to me by my father was one full of humour, pranks, stories. It was above all an oral culture, and one thing you notice about the old Gaels is their way with words whether in Gaelic or English. That community has been replaced by something else. The interdependence is no longer there. The community is in transition. It may well become as closely-knit as before depending on how the future unfolds. For now, we have many people in the islands who have no wish for that kind of intimacy. If they learn Gaelic, what has that achieved? As the old Gaels say “you can’t put trousers on a cat”! At one time in my life I advocated the encouragement (not teaching) of Gaelic in all the primary schools of Scotland. One ‘champion’ amongst the teachers of the school to encourage its use in an informal ‘club’ setting, backed up by dedicated social networking online. Don’t let it anywhere near examining boards! This is to be the ‘secret’ language not understood by social workers, policemen or even other teachers. I would suggest that if you get kids young enough to adopt the language through choice and in a spirit of resistance, you will have sown the seed of a movement which could spread and take hold. What a lucid post, Duncan. Your sentiments are moving and yet you bravely acknowledge the waves of changes that are inevitably happening. So many of us sometimes romanticised the old times (which are in many ways romantic themselves) and find it difficult to face the present…I love your idea of it being a secret language amongst the kids! BTW, where in the Western Isles are you from? Originally from Skye. The Irish tried everything to make the language catch hold, from making it compulsory in schools to positive discrimination in college admissions. They seem to have failed. 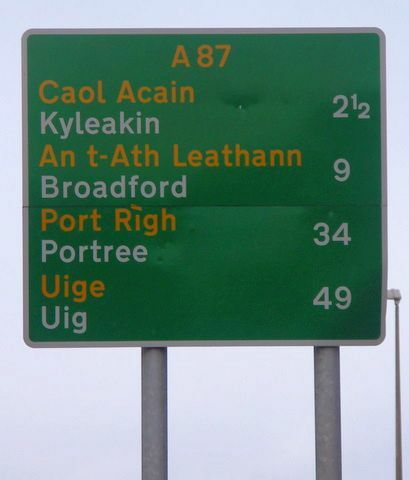 A more subtle approach is required, making a virtue out of Gaelic’s absence from commerce, Government and politics (forget about the lip-service). This is a secret society which should owe nothing to any politician or Government department. In fact the best thing that could be done for Gaelic would be for David Cameron to ban it! The French are proud of their own language, as are the Germans and the Spanish, yet English is commonly spoken throughout their domain because it is the common language between us for economics and commerce. So let us stand equal to them and be proud of speaking Gaidhlig whilst we also speak English – after all it is the oldest continuously spoken language in Western Europe. Highland language, education, customs and dress has been under continuous active duress from Culloden to the present day, but government are the ones who lead us. Perhaps we should take a leaf out of big businesses book and form pressure groups to continually present our case at every opportunity at every level, (maybe starting with Highland Councillors). Then perhaps the highlanders will not be SCARED to propound their heritage as a good thing. Good comments, especially from Akerbeltz. Perhaps it’s worth mentioning that going around Scotland (and even some part of northern England is like wandering around enjoying the scenery in monochrome – it’s there, and you may be impressed, but there’s something missing that you may not even be aware of at first. Support for Gaelic and all Scotland’s languages. A language is not just an instrument, it’s a way to think and see the world around us. I confirm all cognitive benefits bilingualism brings. It also helps to resist to Alzheimer’s disease! Languages are not life forms, they are not made to die, they can be immortal if their speakers won’t stop speaking them for any reason. we discovered benefits of bilingualism after many studies. ancient people didn’t know them, that’s why many ancient languages are dead, otherwise they would still exist because none of them would’ve been dumped. I didn’t discover these things, many other people know about this and many people will in the future. I will ALWAYS support the preservation of every language, no matter how many speakers it has (don’t care about it). Keep Gaelic, Scots and Scottish English dialects alive and don’t let RPies* destroy them, just like Catalans are keeping their tongue. I’m with you, even if I’m not Scottish. Good luck. Best wishes. Sorry for possible mistakes, English is not my mother tongue. P.S. : 70% of the world’s population doesn’t speak English sufficiently well to hold a conversation with a native Anglophone.